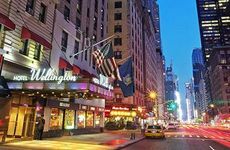 Enjoy special rates at this New York City hotel. To check rates and availability, click the Deal button and scroll down to enter in your dates of travel. Expedia rates may change quickly, and depend on your specific dates of travel. This deal was published on expedia.com with a starting price, which means that rates begin at the price listed but may be higher depending on your dates of travel. Limited Time Offer - Book Now & Save! The description of the deal on this page is a summary of terms published by expedia.com Additional terms and conditions may apply. Taxes, fees and surcharges are not included unless explicitly stated otherwise.